Drawing of 105 mm wz.1929 gun from a manual . A battery of 105 mm guns wz.1913. 105 mm gun wz.1913 in interwar period. 105 mm field guns, designed by French Schneider, were a mainstay of Polish long-range artillery at the outbreak of World War II, despite their range was lower, than of newest opponents of the same class. The first one, designated as 105 mm armata wz. 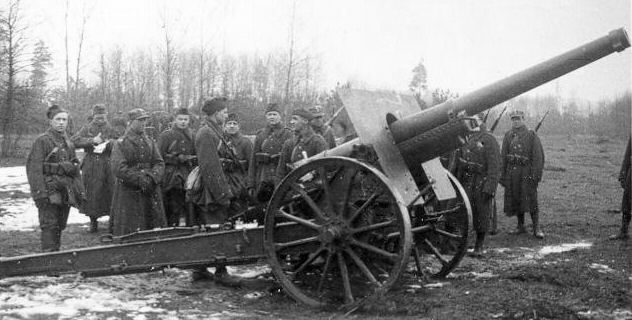 1913 (wzór 1913 - 1913 Pattern cannon) was a popular French canon de 105 mle 1913 (or L 13 S) from before World War I, used by several countries thereafter. The 105 mm armata dalekonośna (long-range cannon) wz. 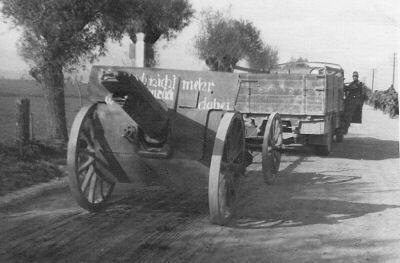 1929 was Schneider's newer export model, differing among others in a split-trail carriage and longer barrel, resulting in longer range. The latter one was also manufactured in Poland. Their abbreviations are also sometimes shortened to wz. 13 and wz. 29. Note: since this page is focussed on Polish usage, you can read more about a development and design of mle 1913 gun in Wikipedia article. Letter W in a text indicates external links to relevant Wikipedia articles. A quality of photos, mostly taken by anonymous soldiers, is not very good, but we chose best illustrating ones. 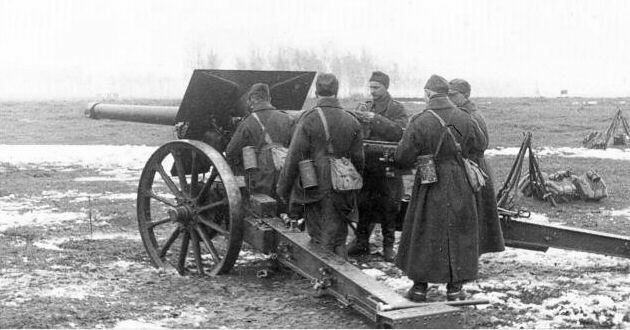 The first Polish unit to use mle 1913 guns was allied General Józef Haller's Blue ArmyW, created in France in 1917. They were used in two Heavy Artillery Regiments - 16 guns 105 mm in total. After World War I, in spring of 1919 the army returned to Poland with its equipment. Since Poland was involved in a war with Soviet RussiaW at that time, further deliveries from France followed from mid-1919. 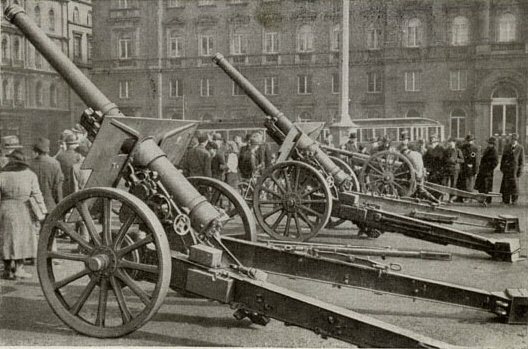 In spring 1919 also 12 guns of Italian-made version (Cannone da 105/28), differing in some details, were bought. Poland had no other guns of its class apart from 4 Austrian 104 mm M.15 gunsW by then. 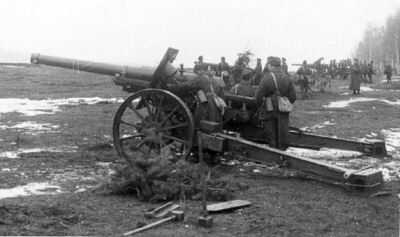 By July 1919 there were created seven heavy artillery detachments, containing a battery of 4 guns 105 mm (in addition to 8 howitzers 155 mm). On 1 October 1920 there were 65 French 105 mm guns in total, of which 45 were used in 13 frontline batteries. There were also 7 Italian guns in inventory at that time, but 6 of them were used in armoured trains or river craft. After the war, it was decided, that 105 mm wz.1913 gun would be a standard long-range gun in Heavy Artillery Regiments. In 1923-1927, further 54 were bought, and in 1931-1939 years there were 118 of them in inventory. 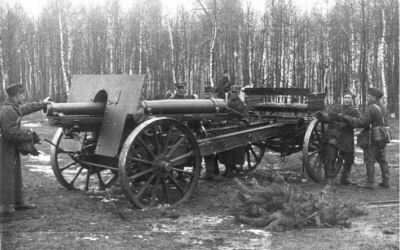 105 mm gun wz.1913 in the 7th Heavy Artillery Regiment in Poznań, 1931. A barrel shows maximum elevation. Well visible is a spade (dug in a ground in combat position), and an aiming shaft. 105 mm gun wz.1913. The layer is aiming, while the rest of the crew is turning the gun (the nineth gunner might be behind a right wheel). The commander is on the right, directing with a T-shaped aiming shaft. Up and below: 105 mm wz.1929 guns in interwar period. Up: 105 mm wz.1929 gun. Note hammers to ram spades. A short rammer lies on left trail, by the regulation. The wz.1929 gun in a transport configuration. German-captured wz.1929 guns (in a background probably wz.1913 one). Note barrels at highest elevation. 105 mm wz.1929 gun of Naval Light Artillery Detachment at Oksywie, most likely destroyed by a crew. German-captured gun wz.1913, with inscriptions made by new owners and a barrel in a transport position. Well visible is a two-part shield, without a lower hinged part (a crank is for brakes). In a meantime, Schneider developed several new export models of 105 mm field guns, with split-trail carriage, offering longer range, than wz.1913 gun. It should be noted, that they were not a simple development of mle 1913 gun, but new designs, with different barrel and breech. After evaluation, in 1930 Poland ordered a new model of 105 mm gun, designated as wz. 1929 long-range cannon, and also acquired a licence to manufacture it in Zakłady Starachowickie in StarachowiceW. 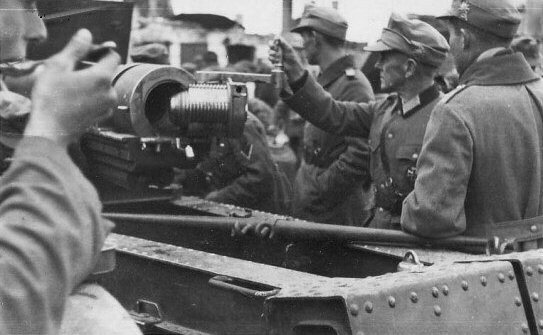 In some Western publications there is an erroneous information, that the wz.29 gun was Polish modernization of wz.13 guns, or a Polish improved design. Exact numbers of bought and manufactured pieces are unfortunately not clear*. By 1935 there were 96 guns delivered from France (possibly up to 104 in total). It is estimated, that 40-48 guns were manufactured in Poland before the war, starting from 1937. Maximum production capability was only 4 guns per month (the lowest of artillery pieces manufactured in Poland). There is quoted a number of 124 guns in inventory in August 1939, but it apparently does not count reserve. Comparing these figures, and a report below, there could be around 140-144 guns wz.1929 available at the outbreak of World War II. * At first, 14 batteries (56 guns) were ordered in France on 13 January 1930, for $99,490 per battery, but an order was increased and 96 guns were delivered by 1935. Since there was an offer for 26 batteries for $92,500 per battery, it is possible that 104 guns were bought from France, especially, that 104 guns were in inventory in November 1937. This number however might include the first Polish battery manufactured by 18 March 1937. There were fulfiled orders for 4 (FY1934/35), 16 (FY1936/37) and most probably 20 guns (FY1937/38) at Zakłady Starachowickie. It is not known if further 20 guns ordered at Zakłady Południowe in Stalowa WolaW were completed (scheduled date by January 1939). There were also next 12 guns ordered there (scheduled date by July 1939). In General Miller's report on Polish artillery from June 1939, 44 guns were indicated as ordered for FY1939/40 (probably this number is a total, covering also earlier orders, not completed by then). It might be noted, that also two Schneider guns of earlier export mle 25/27 variant, developed for Greece, were bought for evaluation and they were eventually used by the Polish Navy as a coastal Battery No. 33 (so-called "Greek" Battery), at Hel PeninsulaW. They had the same barrel length and ballistic performance, as wz.29 guns, but they differed in more complicated split-trail carriage, with wheels hinged along with trails, and a central pod, offering a greater traverse (80°). Also two heavier 105 mm Schneider guns mle 1930 (L/48, range 20 km), developed for Denmark, were acquired by the Polish Navy, creating a coastal Battery No. 32 (so-called "Dannish" Battery). These coastal guns are not the subject of this page however. According to General Miller's report, there were 254 105 mm field guns available in June 1939, including 14 in reserve (unfortunately without a breakdown on types). It appears, that apart from 118 guns wz.13 and 124 guns wz.29, there were 12 reserve guns of unspecified model. At that moment further 44 guns were indicated as ordered, and part could have been delivered by the war's outbreak, possibly raising a total number to some 262-270. There were approximately 845 rounds per gun available in total (as for 240 guns), i.e. 21 calculated units of fire (40 rounds). Numbers below show, that only 190 guns were eventually assigned for mobilized units. Some further guns might have been used as replacement, or in improvised batteries created by reserve centres. All the guns were horse-drawn. 105 mm guns were first of all used in heavy artillery detachments (Polish: dac - dywizjon artylerii ciężkiej) of all 30 regular infantry divisions, consisiting of a battery of three 105 mm cannons and a battery of three 155 mm wz.17 howitzers. These units were not existing during a peacetime, and were mobilized by peacetime heavy artillery regiments. There were plans, that a detachment should have one four-gun 105 mm battery and two four-gun 155 mm batteries, but unfortunately they were not realized before the war, in spite of enough number of guns available. As a result, a number of heavy artillery pieces available for a division commander must be described as very scarse. Also, contrary to plans, 10 reserve infantry divisions had no own heavy artillery assigned. 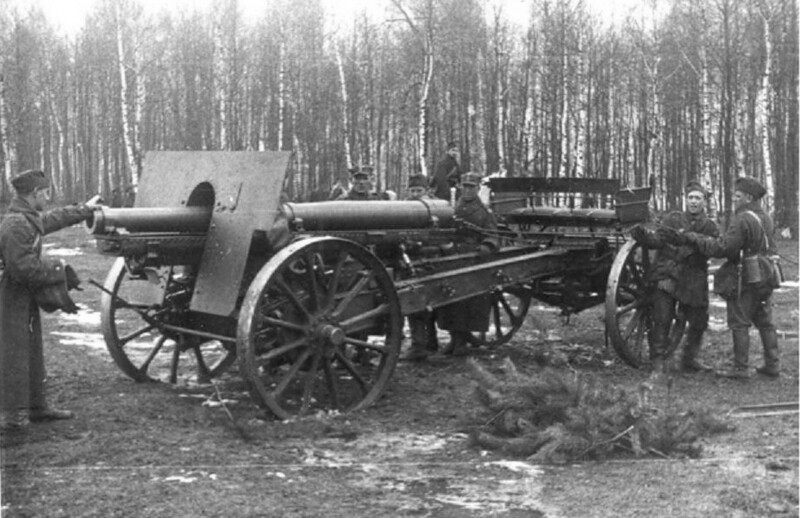 105 mm guns were also used in eight wartime heavy artillery regiments (Polish: pac - pułk artylerii ciężkiej) of a Commander-in-Chief reserve, Nos. 1 to 7 and 9. Each had the 1st detachment with twelve 105 mm cannons in three four-gun batteries, and the 2nd detachment with twelve 155 mm howitzers. There were plans to create nine 105 mm detachments, but they were not realized. A special user of four 105 mm wz.1929 cannons was Naval Light Artillery Detachment (Morski Dywizjon Artylerii Lekkiej) of the Land Coastal DefenceW, defending an area around GdyniaW from 1 until 19 September 1939 (it is not clear, if they count into numbers quoted above, belonging to the Navy). The unit was organized shortly before the war and had no own means of transport, nor horse teams (it also had seven 75 mm wz.1897 guns). The guns, with standard wooden wheels, could have been towed for short distances using Citroën-Kegresse P17 halftracks from a naval searchlight company, but long-range cannons mostly took stationery positions at OksywieW (West of Gdynia). Among others, according to memoiries, on 15 September they shot at detected German airfield near RewaW, damaging 15 aircraft. It should be noted, that between 1932 and 1935 several guns wz.29 (4-8?) were used in the 1st Motorized Artillery Regiment in StryjW. They were towed by Citroën-Kegresse P14 and later C4P halftrack tractors, using special sprung trailers with two rubber tires, put under gun trails. By 1935 they were withdrawn from a motorized artillery in a favour of 120 mm wz.78/09/31 guns, although there were subsequent plans to motorize at least 5 heavy artillery detachments of C-in-C reserve, probably using French motor equipment, not realized before the war. The guns captured by the Germans were designated as 10,5 cm K 13(p) and K 29(p) and employed for secondary combat duties, like coastal defence. For example, in May 1941 there were 11 four-gun batteries with Polish cannons deployed in Norway. In October 1940 the Germans sold 54 guns wz.1929 to Finland, where they were designated 105 K/29 guns. They were used against the Soviet Union during the Continuation War (1941 - 1944) in five Heavy Artillery Battalions, and were an important addition to the Finnish artillery, which suffered a shortage in counter-battery capability. In 1944, eight guns were lost. The rest remained in warehouses long after World War II, being fitted with pneumatic tires. It should be noted, that Finland used also 12 mle 1913 cannons bought from France (as 105 K/13). You can read more about 105 K/29 guns on Jaeger Platoon site. Range, practical: 8 000 m 10 000 m ? Traverse: 6° (100 mils) 50° (880 mils) ? Rifling length: 2352 mm 2349 mm ? Width: 2120 2250 mm ? * - maximum range 12.700 m according to some books, but according to 1931 and 1938 manuals it was 12.000 m, and it could be obtained with shrapnell only. German-captured guns wz.1913 (left, with a limber) and wz.1929 (right - with a barrel in a transport position). 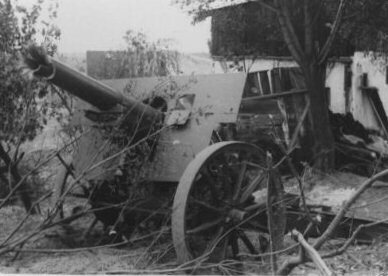 An abandoned gun wz.1913 in 1939, showing details of a limber. A barrel is in a rear transport position, also a spade and a directional shaft is folded. Noteworthy is an open locker. The wz.13 gun had a box trail with a central opening, enabling high elevation. The barrel was aligned with the trail, and had only limited traverse on an axletree (3° to each side, obtained through shifting a gun bed on the axletree). To change direction, the trail had to be lifted and turned by the crew, with a help of a folding T-shaped aiming shaft, above the spade. The wz.29 gun had an upper carriage traversing on a lower carriage with split trail (25° to each side). Its trails had no ordinary spades, but spade cages, into which four removable spades had to be rammed. Apart from a trail, a quick recognition feature were different shields, in spite of their similar rectangular shape in upper part, with rectangular cuts for wheels. In the wz.13 gun the shield was two-part, slightly curved - an outer (upper) part was fixed to a gun bed, and was traversing with the barrel, while an inner part was fixed to an axletree. There was also a bottom hinged part, folding upwards in a transport position. In the wz. 29 gun the shield was flat, one-part, placed higher and farther forward, fixed to an upper gun bed. In case of wz.13 gun, a barrel was slightly shorter, than its craddle, so there was a gap above a front part of the craddle, when the barrel was fully withdrawn to a transport position. A significant detail of the wz.29 gun was a two-part ring at the muzzle, screwed together, meant to stabilize the barrel during transport. The wz.29 gun had drum wheel brakes, the wz.13 gun - lever brakes acting towards wheel rims, behind the wheels. 105 mm guns were towed by eight horses, using a limber put under a tail. In case of wz.13 gun, a lower spade was folding forward in this purpose (it was the same way of transport, as in other Polish heavy pieces with Schneider box beds: 155 mm wz.17 howitzer and 120 mm wz.78/09/31 cannon). In a transport position, barrels in both guns were withdrawn rearwards. In wz.29 gun only, three crewmen could travel on a bench on limber (the rest travelled as a rule by foot). The crew in both guns were 9 men (the commander, the layer, the breech operator, the loader, the ammunition keeper/fuse setter, two ammunition bearers and two helpers). The layer, the breech operator and the loader stood by the gun (the first two could seat in case of the wz.13 gun), the commander was usually right behind the gun. Other gunners had their posts by the amunition dump, which should be behind the gun, to the left of it. It is worth to note, that Italian guns 105/28 differed from French mle 1913 in several aspects. First of all, they had a big one-part shield, curved to cover wheels (weight 152 kg, 4.5-mm CrNi steel). In its lower part there was an additional folding skirt. According to Polish manual, they had left rifling 7° instead of right rifling 7°10' in French gun (a number of 40 groves was the same). Their peculiarity was also an axletree in a shape of an arc, to make traversing easier (it is not clear, if they offfered the same traverse). Wheel brakes were before wheels, under the curved shield (a drawing at Wikimedia). They came with a caisson for 30 rounds of ammo, with additional 20 in caisson's limber. They fired 15.5 kg Ansaldo HE shells with 2 kg of explosive and 16.8 kg HE/shrapnells with 0.15 kg of black powder (300 balls 16 g) and 0.5 kg of TNT in grenade part. Maximum range was 12,500 m.
A breech of wz. 1913 gun (left) and wz.1929 gun (right) (German-captured). - HE grenade wz.1931 (TNT / melinite). Ammunition was separate loading; a propellant in wz. 1913 gun was in brass cartridge case, in wz. 1929 gun - in silk bags. The charge system consisted of packages, that could be removed to get lower range. The wz. 13 gun could use charges 0 (indivisible) or 1, which could be reduced to charge 2; the wz.1929 gun - charge 0, that could be reduced to charge 1 (lower numbers were stronger). As for wz.1929 gun, only wz.31 shells could have been used with strongest charge 0. Shrapnells for wz. 1913 gun were probably withdrawn in the 1930s (in 1938 manual there is no shrapnell described). 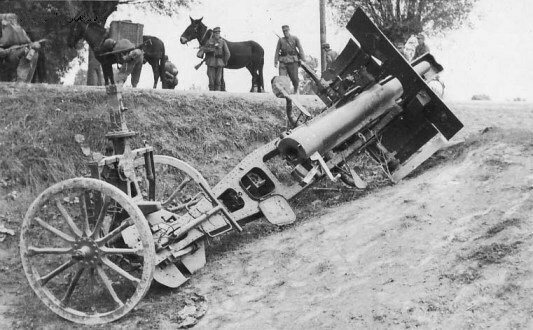 There were no caissons for heavy artillery adopted in Poland by the war, and their ammunition had to be carried in horse wagons and dumped behind guns. There should be 28 wagons with 12 rounds each per a four-gun battery, what gives 7 wagons with 84 rounds (possibly only 80) in total per gun - approximately two calculated units of fire, which was 40. A special caisson, which would allow to shorten artillery columns, was only in trials in 1939. 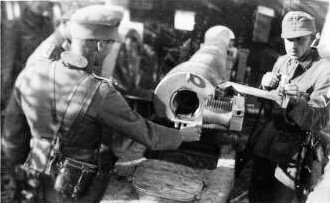 The wz.1929 cannon was the only real long-range piece in the Polish Army, still quite modern, although its maximum range was lower, than of opponents of the same class. 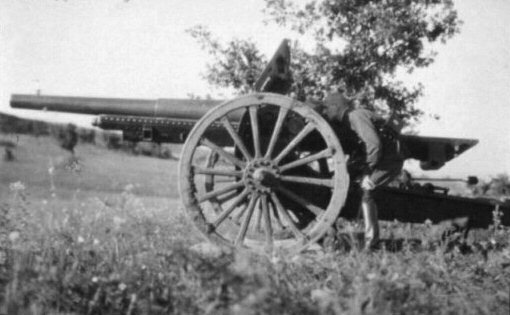 German cannon 10 cm K 18 had an outstanding range of 19 075 m. The Soviet Union used 107 mm M.1910/30 cannons (an old Schneider's design, being a basis for mle 1913, but modernized in 1930s), offering a range of 16 350 m, while newest Soviet 107 mm M.1940 M-60 guns had a range of 18 130 m. Also Czechoslovak 105 mm vz.1935 gun had a range of 18 100 mm. Apart from M.1910/30, these guns were however newer designs, than wz.1929 gun. On the other hand, France adopted new 105 mm cannon - after mle 1913 - only in 1936 - 105 L mle 1936 cannon. Its design was similar to wz.1929 gun, but in spite of longer barrel (L/37.6), its range was marginally better (16 km). A range of wz.1913 guns was still theoretically enough to outshoot 10.5 cm howitzers, being a basic German field piece (though it was not better, than German 15 cm heavy howitzers), but as a heavy artillery piece, the wz.1913 gun was not that mobile in a tactical scale. The problem was also a scarse number of Polish 105 mm guns available in field, poorer artillery survey equipment, and worse operational mobility. A cross-section of 105 mm wz.1913 gun. You can mail me with questions or comments. Text copyright to Michal Derela © 2013.